In the past month, Euro Jordan, FingerTec’s successful reseller in Jordan, managed to close a couple of deals and install FingerTec in several well-known buildings around the country. With the completion of the school installation, Euro Jordan then received another request for biometrics for the company called Ronesca. Ronesca is a French company that specializes in nutritional feeding products for infants and expecting mothers, and has headquarters located in Jordan, UAE, and Saudi Arabia. The branch in Jordan contacted us as they required an access control system complete with an automated door. Euro Jordan took this opportunity to suggest FingerTec’s quick-selling access control model, the Q2i, along with a GEZE automatic door supplied by Euro Jordan. 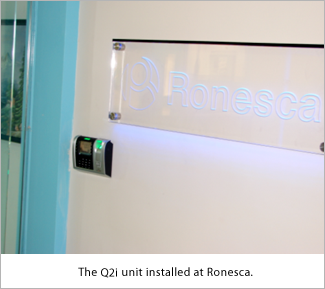 One of the important requirements for Ronesca is the ability for the hardware to connect to their payroll and HR system, and because of this, the FingerTec reseller conducted a training session, The Q2i unit at Ronesca teaching the relevant staff how to connect, manage and integrate the system with a third party software using the SDK. Both the clients were satisfied with their system especially when it came to managing the terminals via the TCMS V2 software. With the current installations in place, hopefully word about FingerTec can be spread more rapidly to bring forward the brand as a leading one in the Jordanian market.